LOS ANGELES, Calif., Aug. 18, 2011 (SEND2PRESS NEWSWIRE) — The Tampa Dragons, a new team in the up-and-coming national Sky Ball League, can be seen battling the Los Angeles 405’s in the Sky Ball League semi-finals (previously taped in L.A.) airing August 20 and 27 in Florida on the Fox Sports Network, on WTVT-13 in Tampa and on DIRECTV nationwide (check local listings for times). The Dragons consist of 5 male and 3 female Tampa locals who were selected from over a hundred hopefuls to compete in the first season of this already popular next generation coed sport. 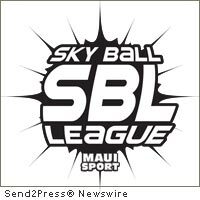 The four teams that were formed and competed in the first season of Sky Ball League – http://www.skyballleague.com – are the Tampa Dragons, Austin Starz, Youngstown Ballers and Los Angeles 405s. The final episode in the series will feature the remaining two teams standing, who will compete in the Tournament of Champions in Los Angeles. This final smackdown determines who gets the winner’s purse of $40,000. Original Keywords: Brian Kessler, sports executive Danny Swartz, Tampa Dragons, Austin Starz, Youngstown Ballers and Los Angeles 405s, Sky Ball League, sports, entertainment, Fox Sports Network, on WTVT-13 in Tampa and on DIRECTV nationwide Sky Ball League Los Angeles California LOS ANGELES, Calif.
REFERENCES: California Business News, Brian Kessler, sports executive Danny Swartz, Tampa Dragons, Austin Starz, Youngstown Ballers and Los Angeles 405s, Sky Ball League, sports, entertainment, Fox Sports Network, on WTVT-13 in Tampa and on DIRECTV nationwide Sky Ball League Los Angeles California LOS ANGELES, Calif.